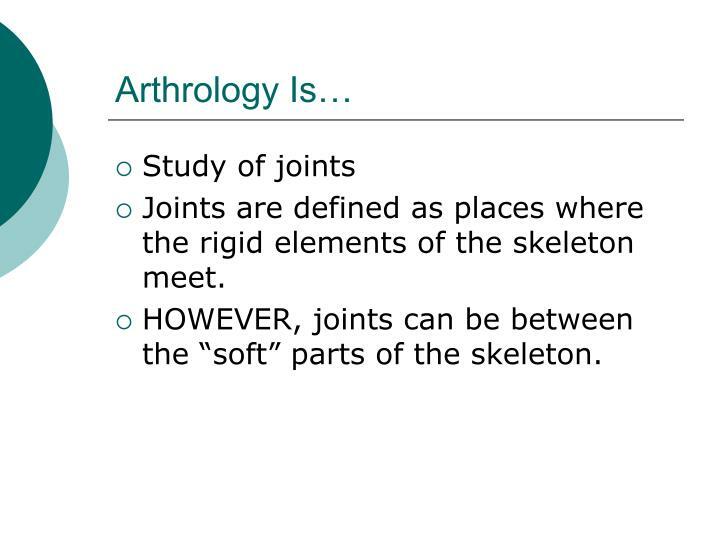 Joints are defined as places where the rigid elements of the skeleton meet. 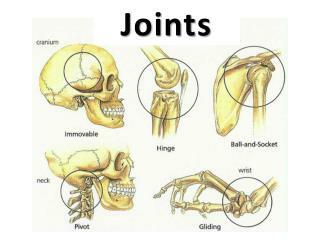 HOWEVER, joints can be between the “soft” parts of the skeleton. 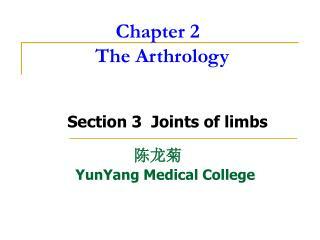 - begins as a joint where there is a fibrous membrane between the two bones. 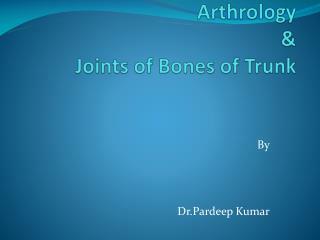 They are sometimes called FIBROUS JOINTS or LIGAMENTOUS UNIONS. - these joints allow some movement while still providing protection. 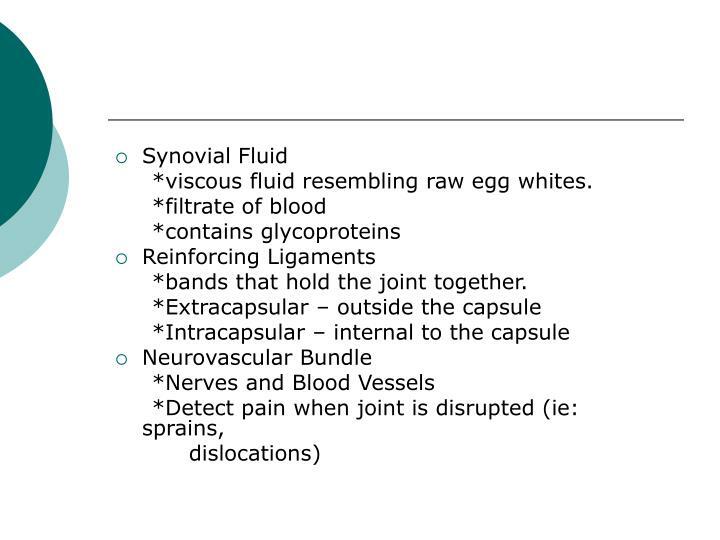 - a serous membrane that produces synovial fluid which reduces friction and absorbs shock. 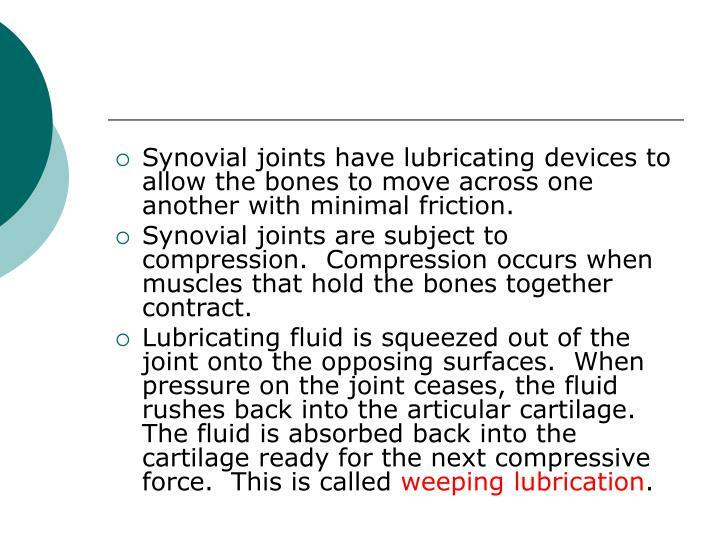 The synovial fluid helps reduce friction, disipate heat, and absorb shock. The articular cartilage acts similarly to “teflon”, which helps reduce friction and pressure. 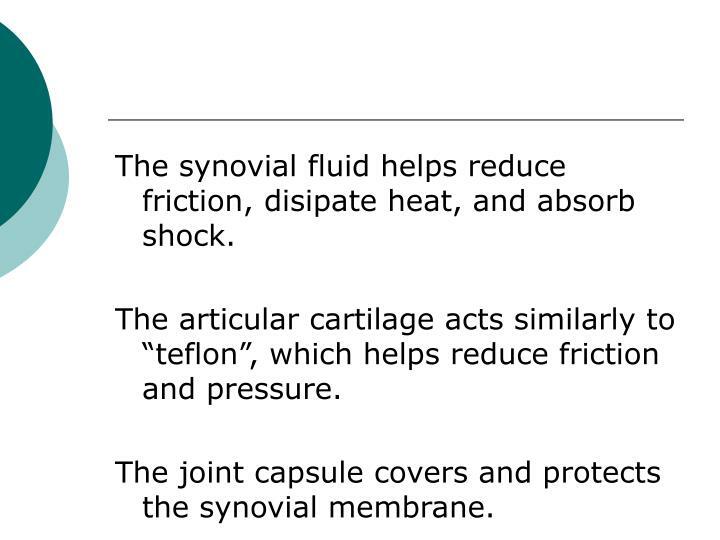 The joint capsule covers and protects the synovial membrane. 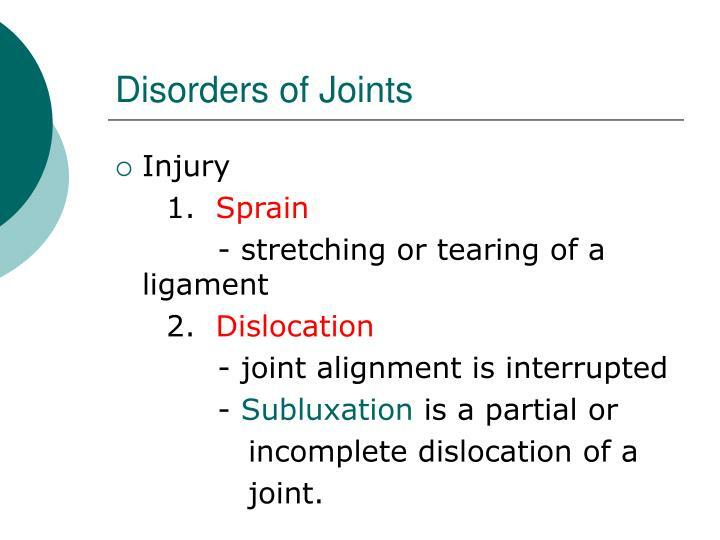 There are several ligaments that help hold the portions of the joint together. Intracapuslar Ligament – hold the bones together. Not found in every joint. 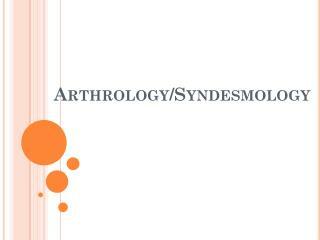 Extracapsular Ligament – called the collateral ligament. 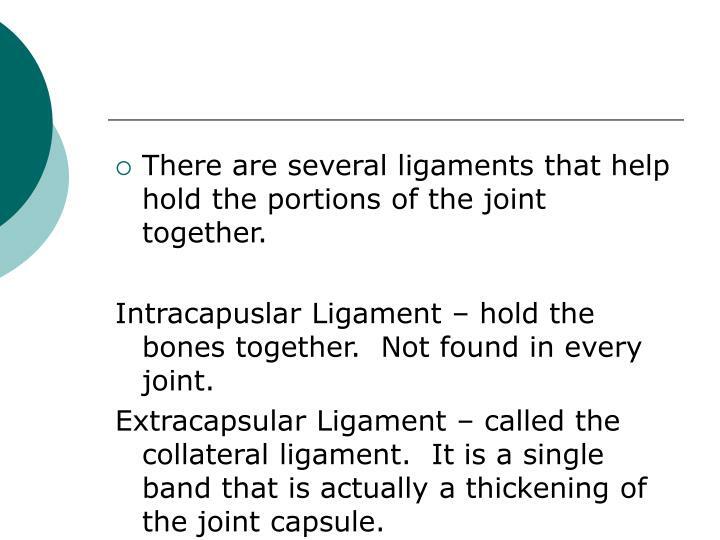 It is a single band that is actually a thickening of the joint capsule. 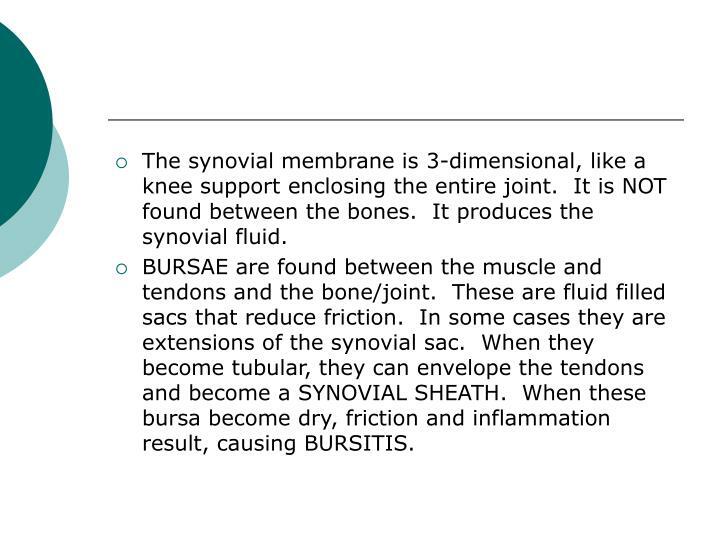 The synovial membrane is 3-dimensional, like a knee support enclosing the entire joint. It is NOT found between the bones. 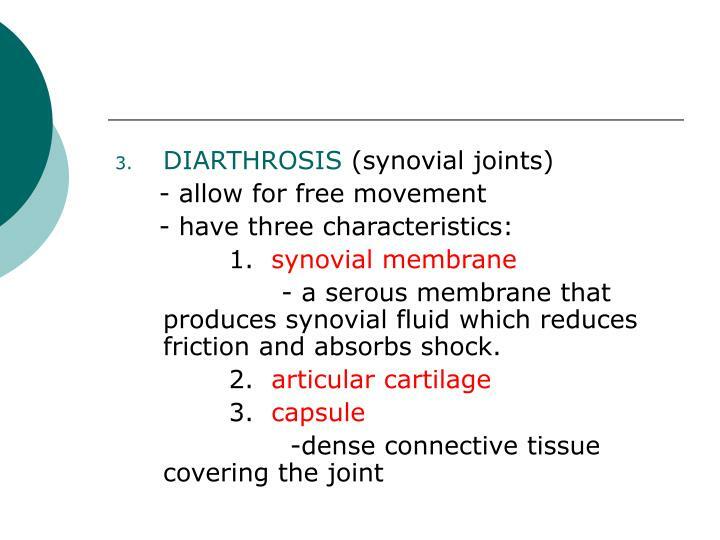 It produces the synovial fluid. 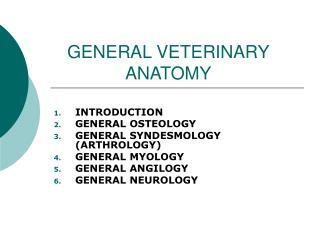 BURSAE are found between the muscle and tendons and the bone/joint. These are fluid filled sacs that reduce friction. 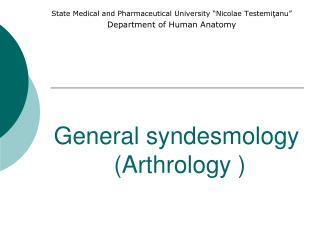 In some cases they are extensions of the synovial sac. 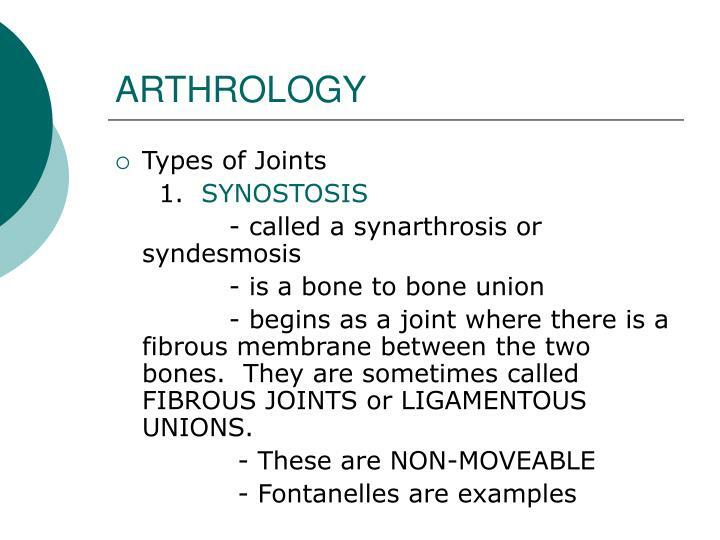 When they become tubular, they can envelope the tendons and become a SYNOVIAL SHEATH. 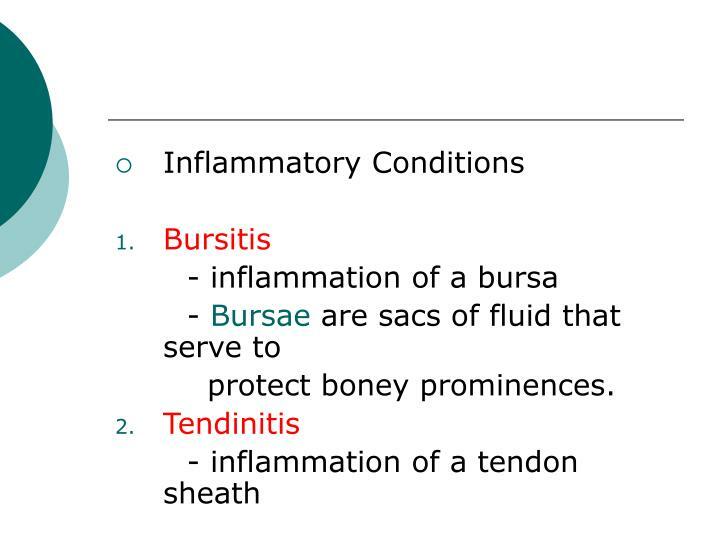 When these bursa become dry, friction and inflammation result, causing BURSITIS. 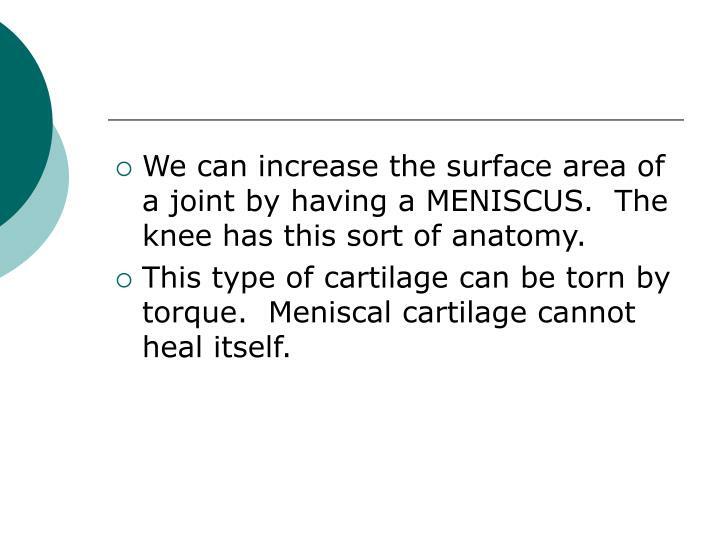 We can increase the surface area of a joint by having a MENISCUS. The knee has this sort of anatomy. 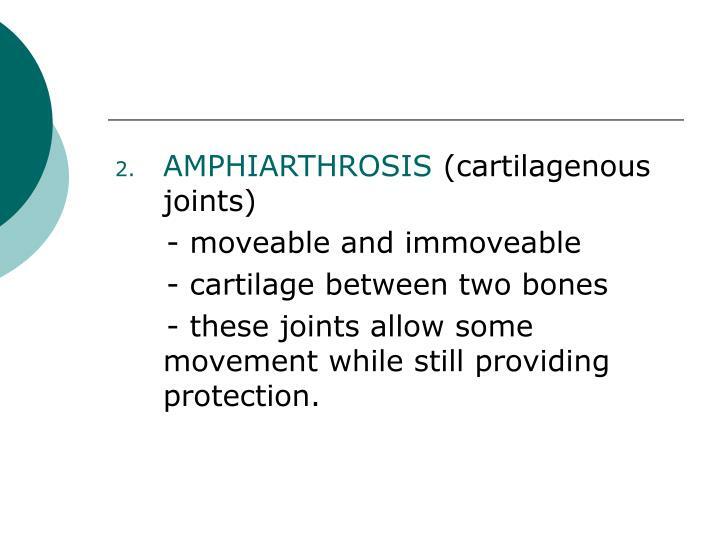 This type of cartilage can be torn by torque. 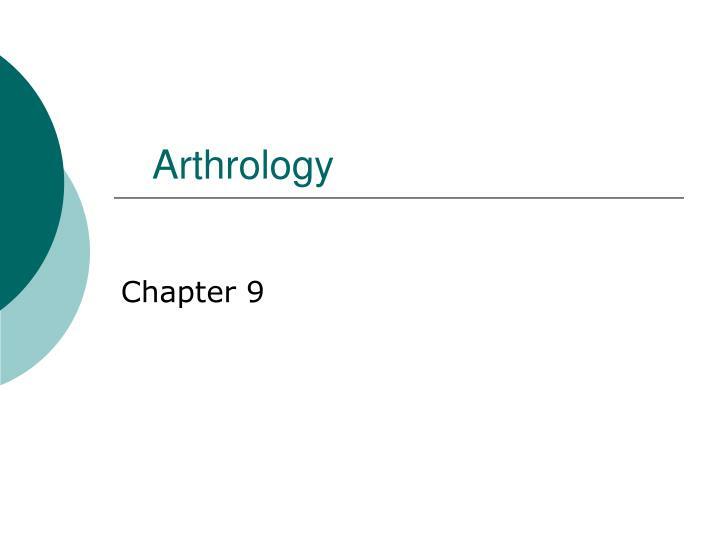 Meniscal cartilage cannot heal itself. 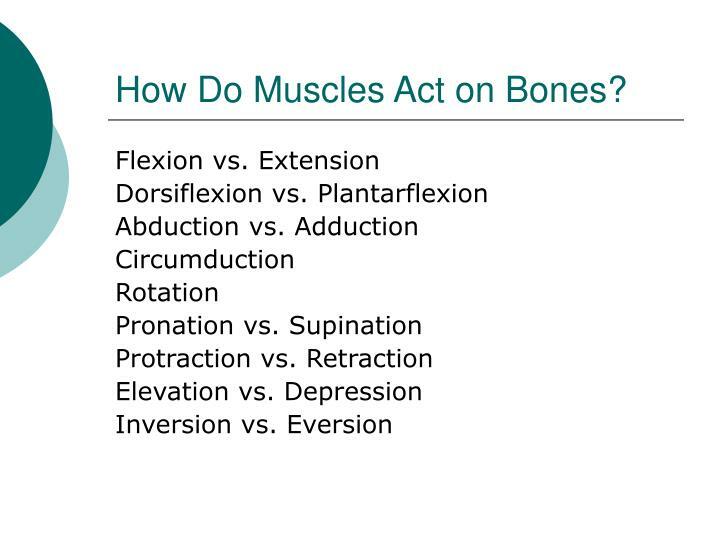 How Do Muscles Act on Bones? 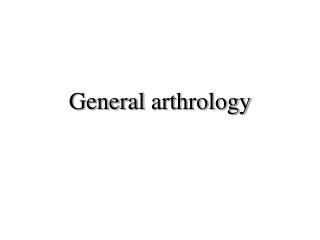 - rounded, pointed, or conical surface on one bone that fits into a ring of bone on another. 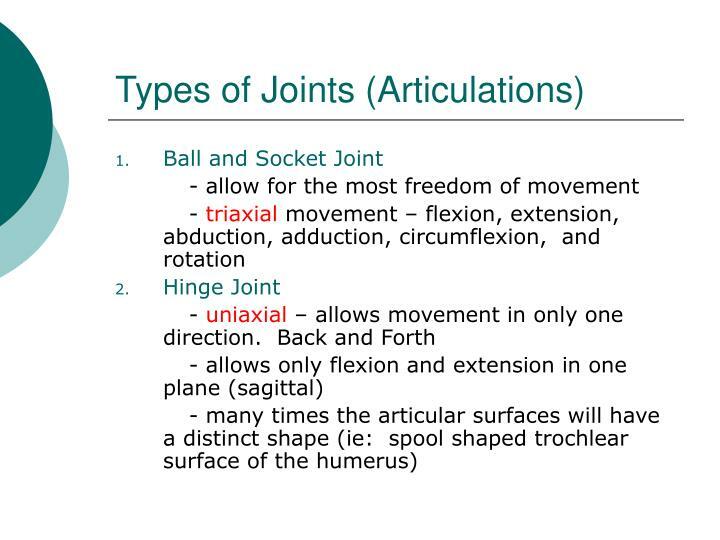 - allows flexion, extension, abduction, adduction, and circumduction. - surfaces are inverted relative to each other. 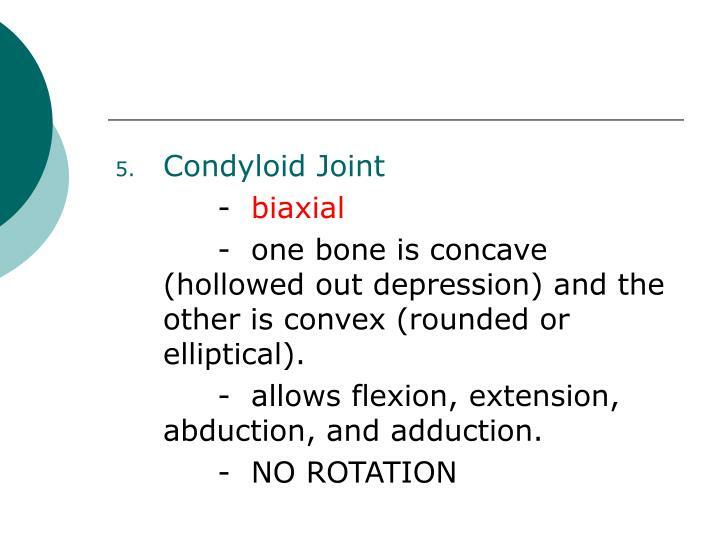 - one bone is concave (hollowed out depression) and the other is convex (rounded or elliptical). - allows flexion, extension, abduction, and adduction. - one side is a slot, the other side is an extension that fits into the slot. 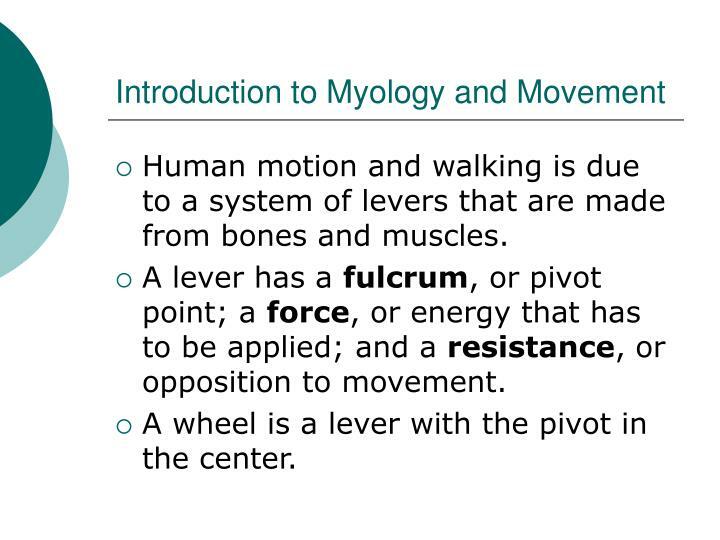 Human motion and walking is due to a system of levers that are made from bones and muscles. A lever has a fulcrum, or pivot point; a force, or energy that has to be applied; and a resistance, or opposition to movement. A wheel is a lever with the pivot in the center. 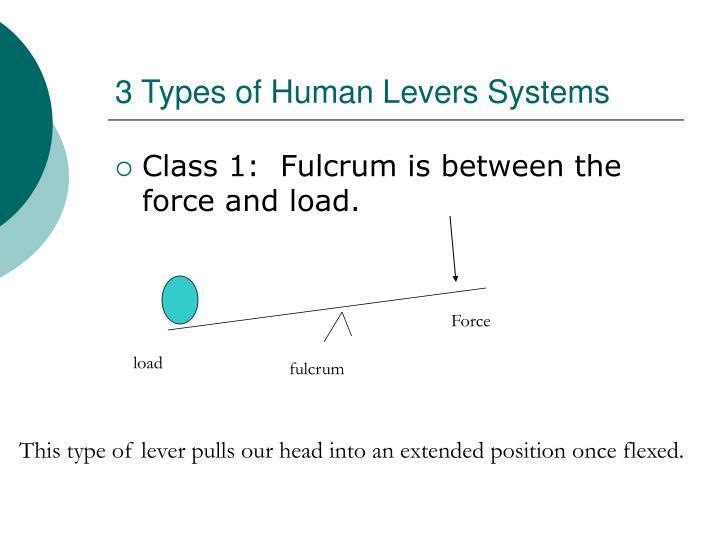 Class 1: Fulcrum is between the force and load. This type of lever pulls our head into an extended position once flexed. 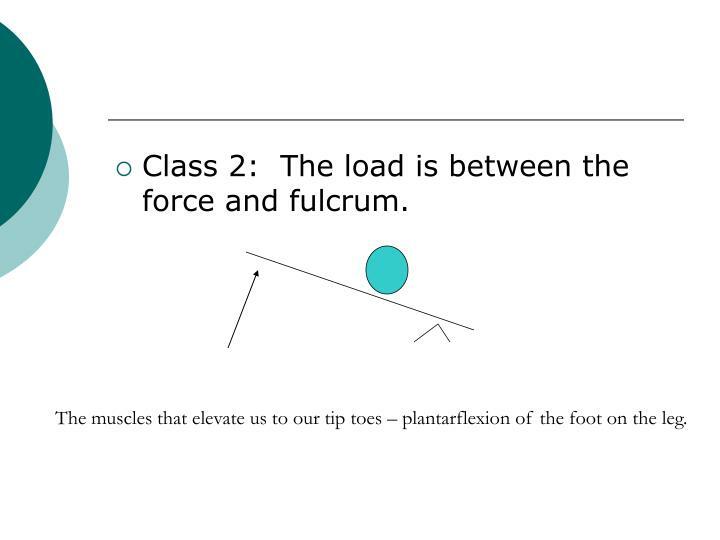 Class 2: The load is between the force and fulcrum. The muscles that elevate us to our tip toes – plantarflexion of the foot on the leg. 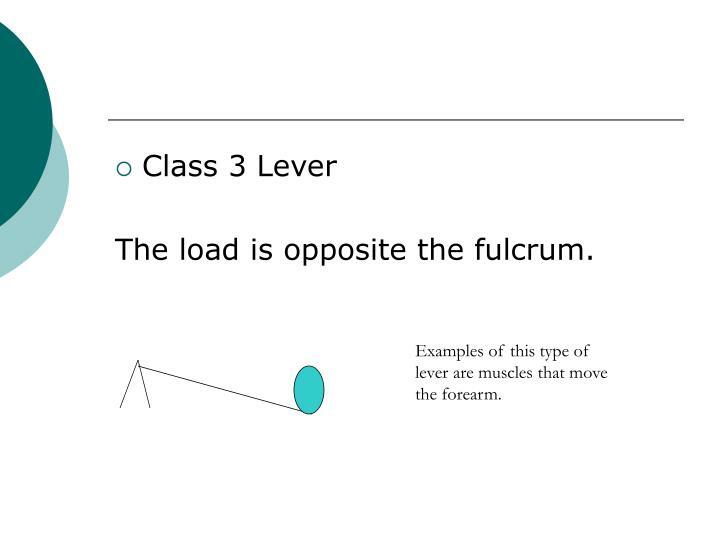 The load is opposite the fulcrum. Examples of this type of lever are muscles that move the forearm. 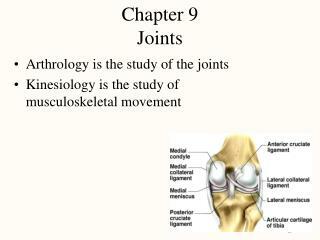 - the joint must allow for movement in plane that the muscle shortens. Muscles that stabilize a limb so it can move is a FIXATOR. For example, the trapezius stabilizes the clavicle and scapula so we can move the arm but not have the head of the humerus become deflected in any direction. 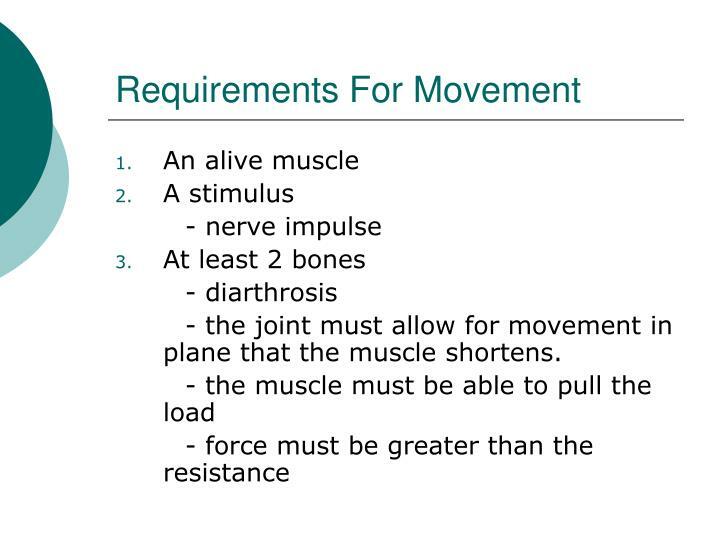 A muscle that provides most of the force for a particular movement is the PRIME MOVER. 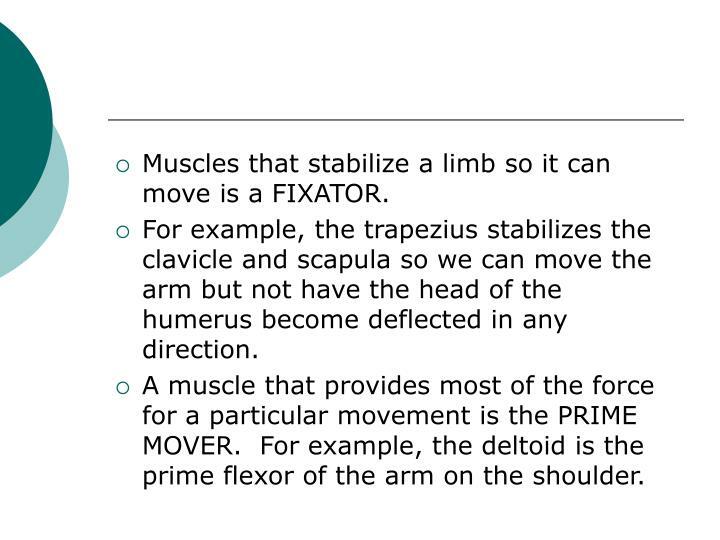 For example, the deltoid is the prime flexor of the arm on the shoulder. For example: The triceps surae (gastrocnemius and soleus complex) plantarflexes the foot on the leg. This is the plantarflexory agonist. The muscles that work against the triceps are the dorsiflexory muscles (tibialis anterior and long extensors). 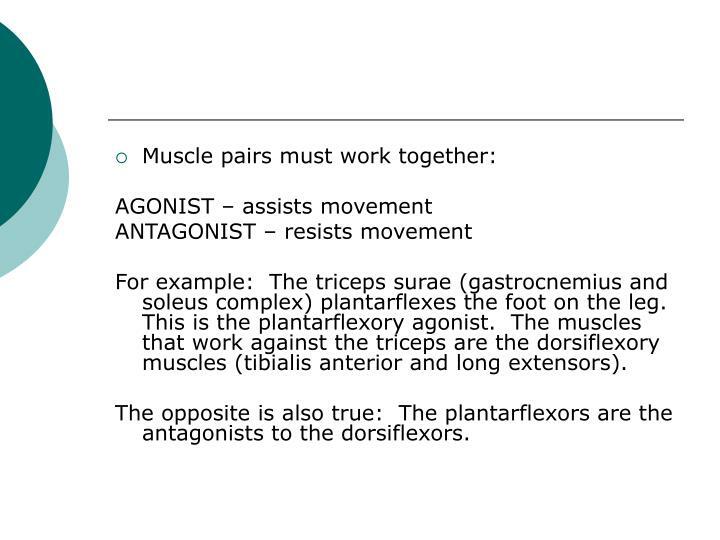 The opposite is also true: The plantarflexors are the antagonists to the dorsiflexors. Articular cartilage enclosed within an articular capsule and lined with a synovial membrane. 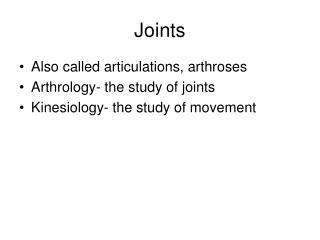 Type of movement depends on the shape and design of the joint. 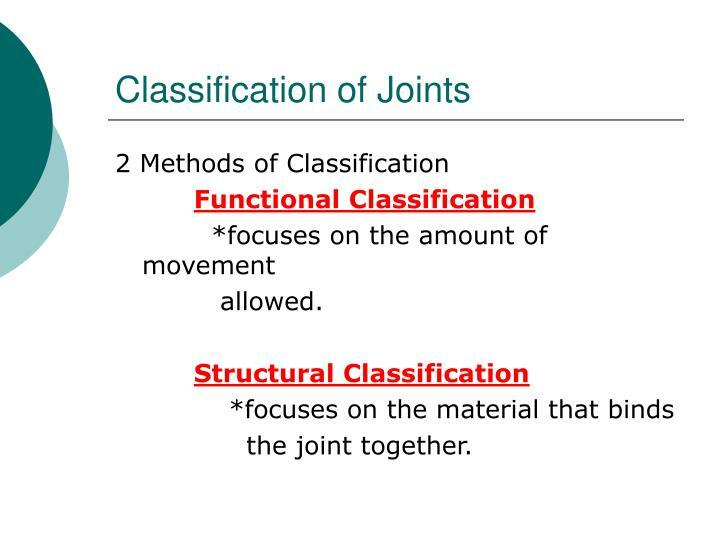 Joint Cavity – fluid filled potential space. 1. fibrous capsule – outside, dense irregular CT that is continuous with the periosteum. 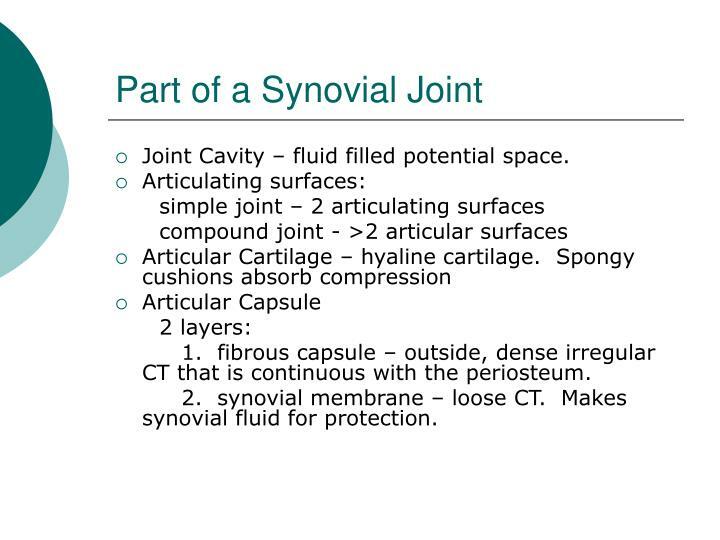 2. synovial membrane – loose CT. Makes synovial fluid for protection. *viscous fluid resembling raw egg whites. *bands that hold the joint together. 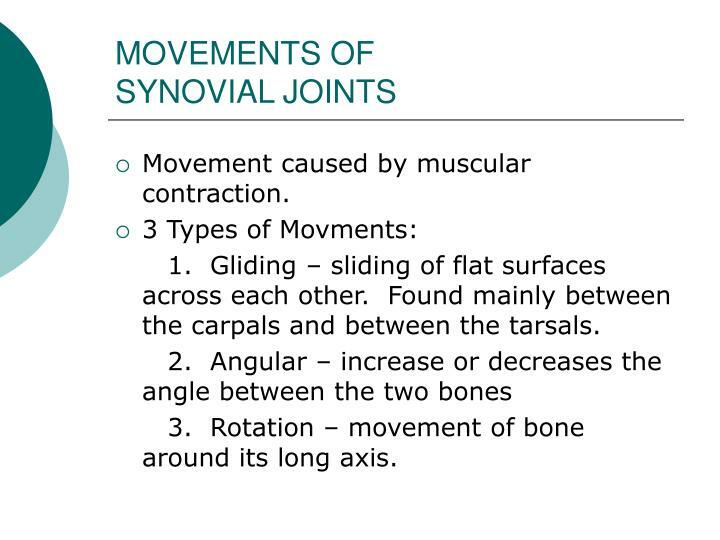 Synovial joints have lubricating devices to allow the bones to move across one another with minimal friction. 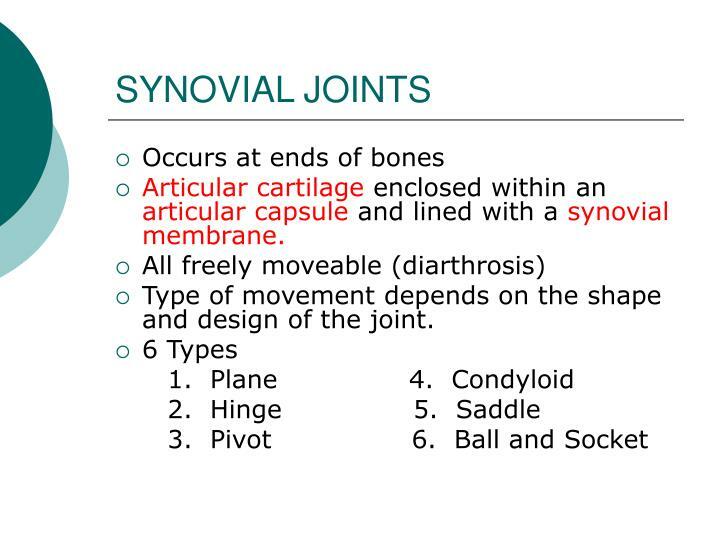 Synovial joints are subject to compression. 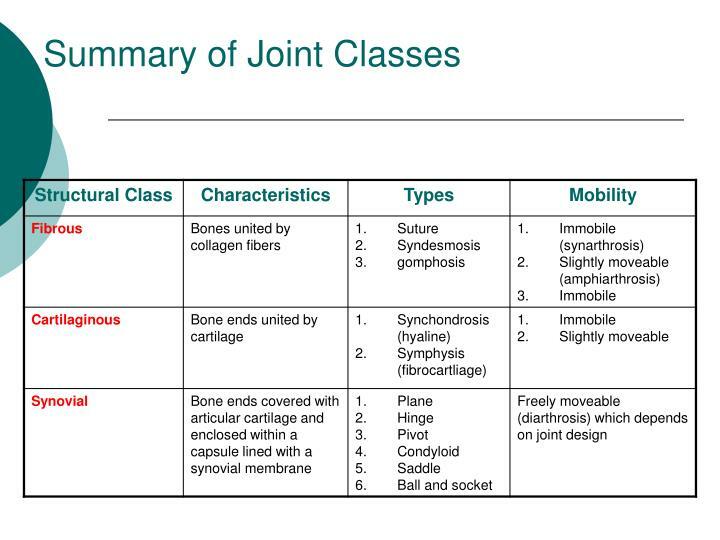 Compression occurs when muscles that hold the bones together contract. Lubricating fluid is squeezed out of the joint onto the opposing surfaces. 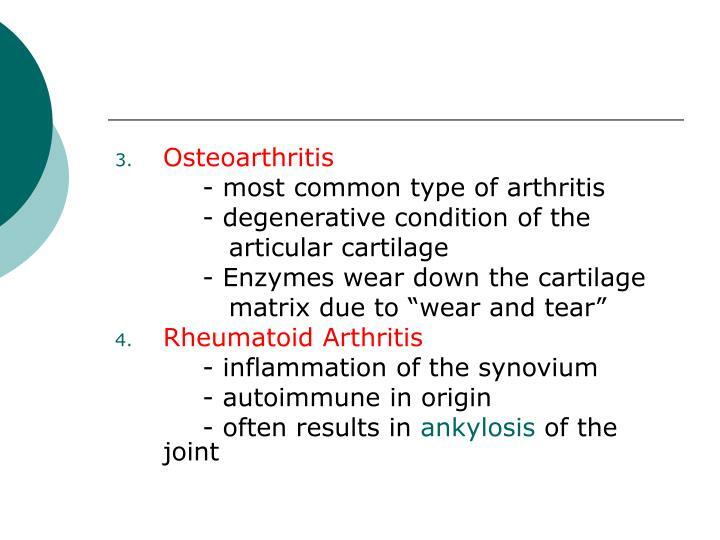 When pressure on the joint ceases, the fluid rushes back into the articular cartilage. The fluid is absorbed back into the cartilage ready for the next compressive force. This is called weeping lubrication. Movement caused by muscular contraction. 1. 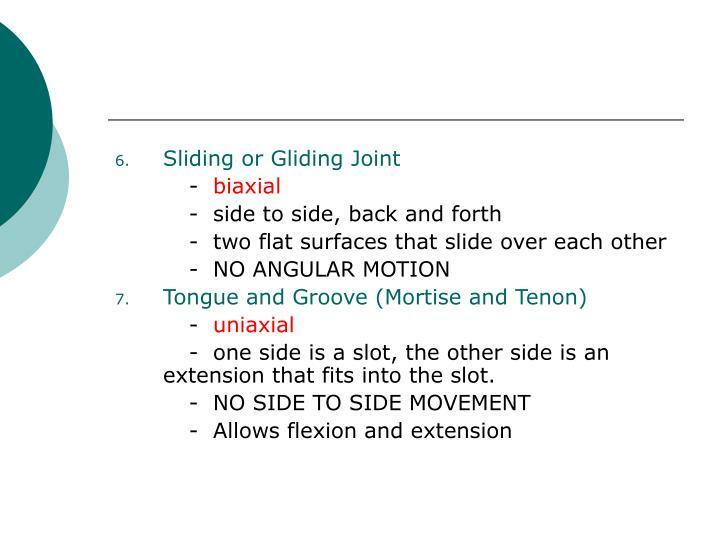 Gliding – sliding of flat surfaces across each other. 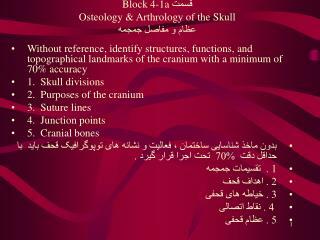 Found mainly between the carpals and between the tarsals. 3. 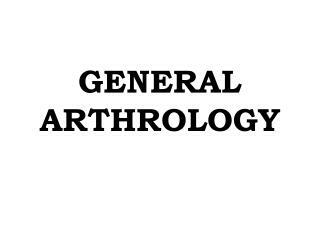 Rotation – movement of bone around its long axis. 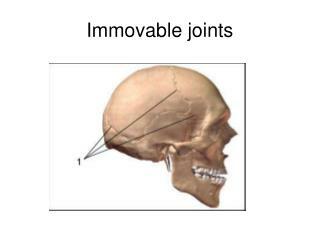 The shapes of the articulating surfaces determine the movement allowed at a joint. 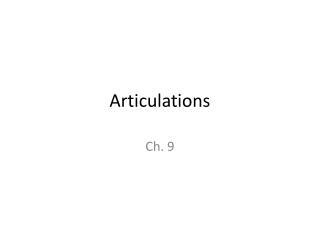 1. plane – flat articular surfaces. Short gliding movements are allowed. 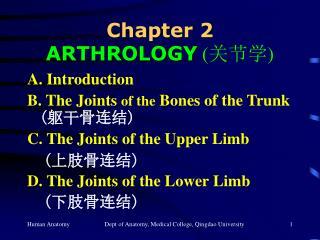 2. hinge – cylindrical end of one bone fits into the trough of another bone. Angular movement is in one plane. 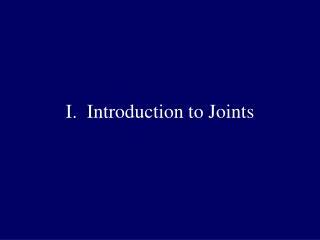 Uniaxial joint along one plane. 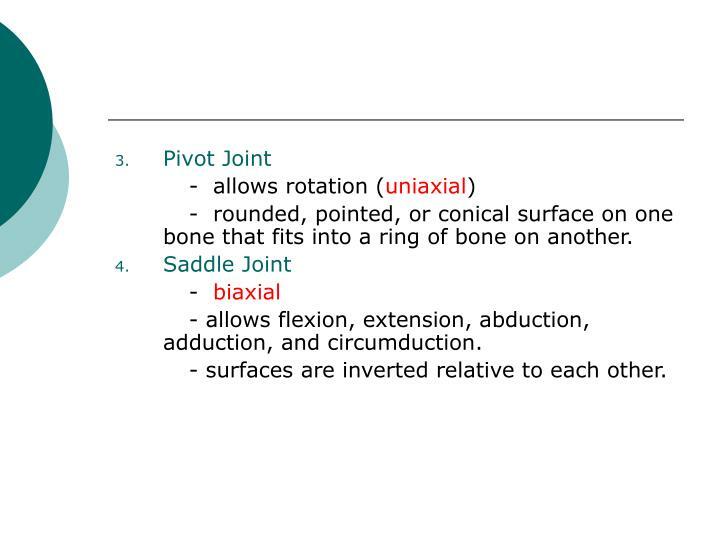 3. pivot – rounded end of one fits into a ring formed by another bone. 4. 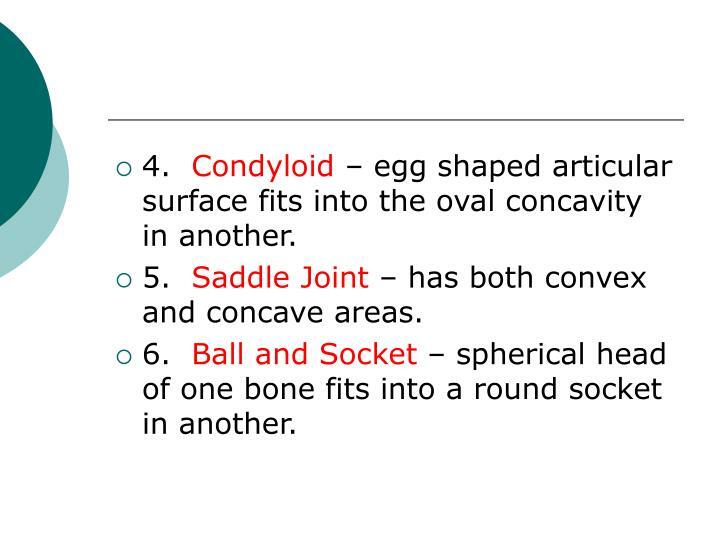 Condyloid – egg shaped articular surface fits into the oval concavity in another. 5. 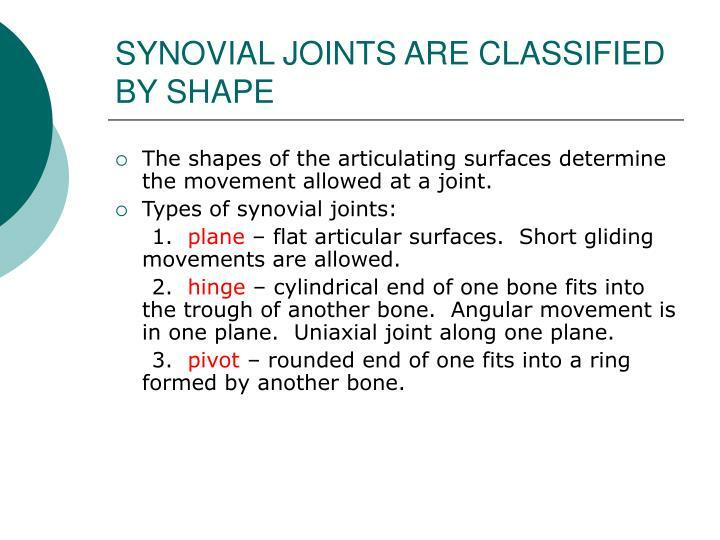 Saddle Joint – has both convex and concave areas. 6. Ball and Socket – spherical head of one bone fits into a round socket in another. 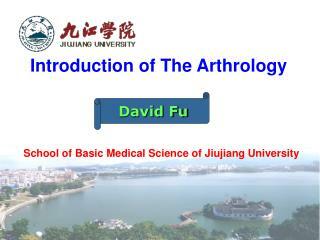 Introduction of The Arthrology School of Basic Medical Science of Jiujiang University -David fu. 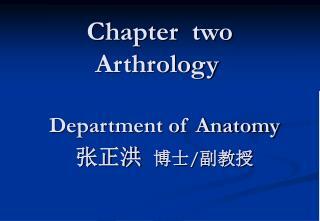 introduction of the arthrology school of basic medical science of jiujiang university. 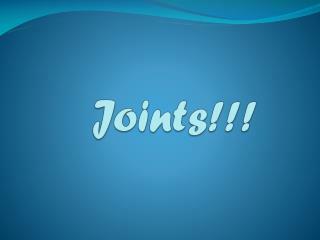 Joints!!! -. 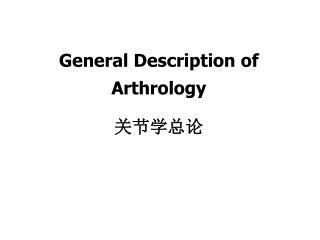 vocabulary:. 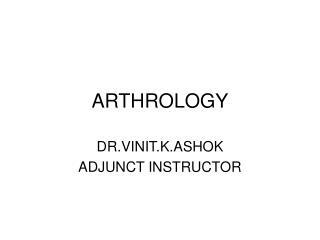 arthrology- the study and treatment of joints. . articulation- a fixed or moveable joint between bones. . dislocation- when a bone is moved from its normal position, it happens mostly in joints.